With the Pearl Harbor attack on 7 December 1941, it became very clear that there was going to be a very large war. George Wynn saw the writing on the wall and quickly enlisted. After boot camp, he and his cohort were suddenly rushed to New York harbor, and shipped to England on the Queen Elizabeth II liner. As a voluntary enlistee, he had a choice in what he would be doing, and chose banker/pay-master. George rode out three years of war as a Buck Sergeant (three chevrons) in relative safety in central England (except for occasional German Buzz-Bombs), and took the opportunity to visit every historical site he could on his days off. James was married (April 1943), and serving in the Merchant Marine when he was drafted (he and his wife Alice at that time had no children, which would have earned him a deferment). He was inducted on 2 January 1944, and actually stayed longer in Boot Camp than most other recruits in his cohort – he was assigned to take an additional month or so of training as an electrician. Probably for this reason, James missed the Allied assault in Normandy, and arrived after the D-Day (6 June 1944) invasion. He initially departed New York City on July 15, 1944, and reached Edinborough, Scotland, via the Queen Elizabeth II liner. The QEII at that time was stripped of all its luxury staterooms, and filled instead on nearly all decks with floor-to-ceiling bunks for the troops, whom it transported across the North Atlantic at such great speed (30 knots) that no U-boat could ever get near it – and destroyer escorts couldn’t even keep up with it. After landing in Edinborough, Scotland on July 21, James was taken immediately by train to southern England near Yoeville, south of London, where as recruits they received an additional 5 weeks of training on the German weapons they would be facing. They then boarded ships in Portsmouth, and took nets to climb into the landing craft that took them to huge new floating docks at Omaha Beach on August 31, the site of terrible fighting and casualties in June. From the beach, they were marched to high ground and were loaded onto deuce-and-a-half Army trucks. The trucks dropped two men off here, three there, to fill depleted ranks of regiments that had already seen action and suffered casualties. On September 3, James was the last off the truck as it arrived at Regimental HQ, a farmhouse in open country in western France approximately 30 miles (50 km) east of the port city of Brest. He gave his papers to a First Sergeant, who gave him a box of K-rations around 6 pm and told him to “go out back, dig a foxhole and someone will pick you up in the morning.” He describes digging the foxhole, and settling in for the night all alone, feeling very strange. Around l am a loud BOOM awoke him, but nothing else happened. At 6 am, he looked around in the morning light and saw a small crater about 15 feet (5 m) from his foxhole; he speculated it was an anti-tank round fired just to harass them. 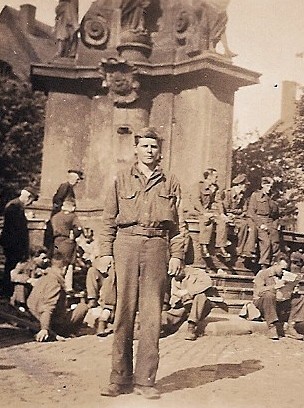 James, at this time, became part of the 9th Army, 2nd Infantry Division, 38th Regiment, 2nd Battalion, Company E, 2nd Platoon. Until then, he didn’t belong to anything – he was just a replacement for someone already killed. Though he finally belonged to something, he and other late-arrivers like him found they were very much not welcome by the battalion they had joined. At 8 am on September 8, each man was given extra bandoleers of rifle ammo, four additional hand grenades, and told to be ready to move out at 10:30 am. This was James’ first combat experience: the final move to capture the port city of Brest. On September 18, when the Germans surrendered, James took possession of a German regimental battle flag which he has today. When the 2nd Division moved to take their position on the front on September 30, the 2nd battalion of the 38th regiment was chosen by lot to detour to Paris to guard railroad yards and ride shotgun on all supply trains moving to the front. The 2nd battalion rejoined the 2nd Division on the front on November lst. James recalls being deployed in a static holding position covering a 23-mile-long (37 km) section of the Front approximately 20 miles (32 km) east of St. Vith, Belgium. On or about November 15, 1944, the 2nd Division was replaced by the 106th Division on this section of the frontline – raw new recruits from Indiana. The 2nd Division then moved northeast approximately 15 miles (25 km) to form an attack position on a regimental front between the 9th and 99th Divisions. They marched through the Belgian town of Elsenborn to their new positions to the east. Their offensive began on or about November 23rd. The temperatures at this time were in the mid-30’s (F) in the daytime and low 20’s (F) at night, with approximately six inches (15 cm) of snow on the ground. Their advance was very slow in a dense forest with large concrete pillboxes spaced approximately 100 to 200 yards (meters) apart, with 100-foot (30 m) fire lanes in all directions so each one could cover and protect the other. There were anti-personnel mines almost everywhere. The fighting was almost continuous from daylight to dark, and daily advances were sometimes no more than 100 yards. They took heavy casualties this entire time. After about 4 weeks, they reached their objective: high ground where the forest ended and the open fields of Germany began. They could look to the northeast down at a dam on the Ruhr River about 4 miles (6 km) ahead (probably Hellenthal, Germany). They were on the crest of Elsenborn Ridge, the dominant terrain feature in that area. It was now mid-December and there was boot-high snow everywhere. On the day of the Breakthrough (the Battle of the Bulge began 16 December 1944), they were the lead platoon – the front line infantry – on the north edge of the breach. They carried M-l rifles, hand grenades, and field packs loaded with clean socks, K-rations, and ammunition. The Front was moving steadily eastward at this time, the Allied commanders trying to reach the Ruhr River to break into the Rhineland – the German homeland, with all its psychological implications. On a snowy December 16th, the “Krauts”* broke through to the south of their position – on their right flank. Initially, they thought that the new guys on their flank were taking heavy artillery (“having a bad time of it”), but then they got word the next day that the 106th Division to the south had been overrun and obliterated. At 2 pm they got word that they had been out-flanked and even isolated – there were now German army elements behind James’ division. At 4 pm they got the word to “move out” and retreated back westwards. As the lead platoon of the advance at that time, they were naturally “the last dogs out.” James said he was one of the last three men who walked out 9 miles (15 km) during the night through an area he described as an unusually eerie, dark forest, floored with snow. * Krauts, from sauerkraut: the common Allied term for the German enemy at the time. Interestingly, James’ mother was Anna Josephine Schneider, born in 1885 in Neu-Ulm, Bavaria, an émigré to the United States with her family in 1886, who spoke only German until she entered elementary school at the age of 7. 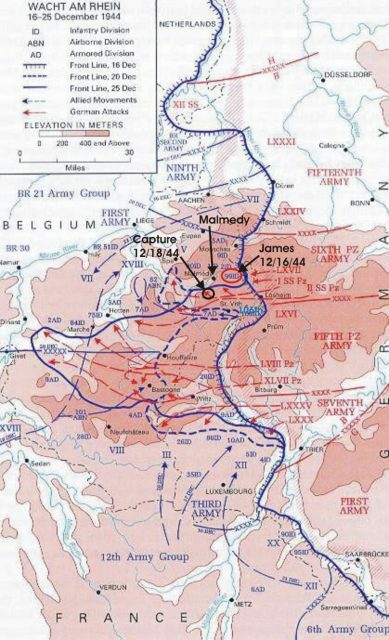 The Battle of the Bulge Map, showing where James was captured. Note the proximity to where the Malmedy Massacre took place. James and his buddies knew better than to stray off the narrow path – he said there were mines and trip-wires everywhere. They knew that they were completely exposed to any enemy action that could come against them. About midnight they got to the village where they had started their latest push (Elsenborn, Belgium). The whole division had already moved to high ground to the north, but James’ small platoon was ordered south to guard an intersection. Interestingly, not a single corporal, sergeant, or officer accompanied them: the NCO’s all then scampered off north to where they believed the Allies were regrouping, essentially abandoning these men. James’ group – 25 privates – were armed with only M-l rifles, plus a bazooka team for support. They dug in on the southeast side of the intersection they were sent to, about 50 yards (meters) from the intersection itself. Around midnight they could hear German soldiers – probably lost – walking down the road. They could tell they were Germans by the sounds of their hobnailed boots on the cobbled road. When the Germans heard the order to halt, they ran west toward the intersection – and were shot. As daylight the 18th of December dawned, they could see that they were in an open field. They also realized then that they had been abandoned by their officers and NCO’s. A German half-track came up with a 20 mm gun and opened up on them, but no one was hurt and it left. About 30 minutes later a line of tanks, separated by about 50 yards (meters) each, came up from south to north, and made an east turn (“of all things,” James said) at the intersection to head east, right past them. On the backs of each tank there were German troops in white camouflage clothing, and James and his platoon took turns popping up out of their foxholes and emptying their clips at the soldiers. He said they fell off the tanks “like sacks of potatoes.” He and his close buddy George Hazlewood took turns doing this, as they had been trained, and James said he shot the soldiers off at least four or five tanks himself. The modern German railway map and probable route of James Wynn from Capture to repatriation. Anna Josephine Schneider Wynn was born in Neu-Ulm, Germany, on 21 June 1885. Foot travel is indicated in blue dashes, rail travel in green dashes. “C47” indicates where the POWs began their final flight to Rheims, France. James probably flew within sight of where his mother was born. Then German infantry appeared advancing towards them from the south. When they came within range, the Americans opened fire and stopped the advance. There was a pause. Then a small reconnaissance vehicle came up and raked their positions with a turret mounted gun – “like a .30-cal machine gun.” A German infantry squad led by an NCO with a machine-pistol then walked from foxhole to foxhole and shouted “Raus! Raus mit handen hob!” (Out! Out, with your hands up!) James told me that he was certain he was about to be killed, but wasn’t concerned about himself – instead he had a terrible sense that he had failed in his responsibility to his single mother and his young wife. As he waited for what he thought was inevitable death, he heard a voice “…like me and you talking, Jeff,” that reassured him that they would be OK. That HE would be OK. For the rest of his life he had no doubt in his mind about the source of that voice. He stood up facing a gun-barrel pointed at his head. He told me in 1968 that he thought the German soldier paused then and didn’t shoot him because he had blond hair and blue eyes. They followed directions to join other GI’s, already captured. Of the 25 men in his platoon the evening before, only 11 were alive. It could have been worse: just a few miles farther north, Joachim Pieper’s 12th SS Panzer Division massacred nearly 500 captured American POW’s who had been collected in a field near Malmedy. 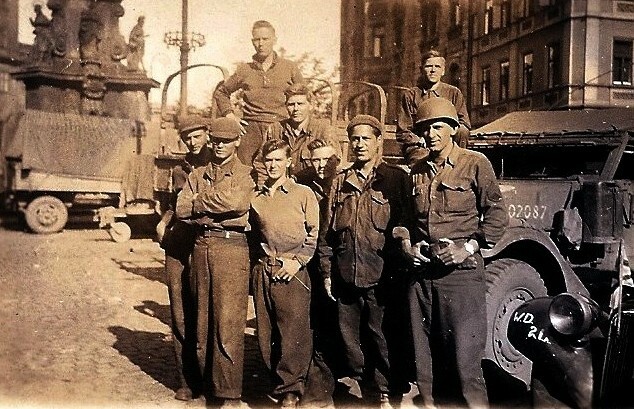 James said the men who took them out of the intersection were regular German army, and not SS; they weren’t trying to rack up a count of men they had killed, but were conscript infantry – just like James. After capture on the morning of December 18th, they were accumulated first in a dirt field. American 105-mm Howitzer phosphorus shells began to land around them. They were near a German first-aid station, but it wasn’t clear if Americans were being treated. They were then told to start marching at dusk back down the road the tanks had come from. Their guards were wounded German infantry soldiers. The road had huge numbers of trucks and horse-drawn wagons moving east, bringing supplies to the German troops participating in the Breakthrough campaign. James noticed that the road paralleled a stream, with steep hills on both sides, and he thought they were sitting ducks for any strafing aircraft. This never happened – the Germans had timed the Bulge incursion in part on the weather to give them cover from Allied aircraft. The POWs ended up about 20 miles (32 km) back from the Front; they were marched at gunpoint all night long to get to the next accumulation point, and were held in what he describes as a huge barn starting on the 19th of December. They were kept there for 3 days, and fed only rotten, golf-ball-sized potatoes, which he said they boiled and that “tasted good,” because they were so hungry. They started marching again, “towards Bonn, Germany” (they saw signs to that effect), and James said that he began to get used to sleeping on concrete floors after 2 nights. They marched 3 days to a camp with 12 buildings, where they arrived on 24 December. The next day, Christmas, the 500 or so troops thus far gathered were provided a single 40-gallon (150 litre) large cook pot with sauerkraut and pork pieces – by the time James got his turn, it was sauerkraut and pork grease – but it was a dinner! That day James saw his first German jet fighter plane. A possible location for this holding camp is between Bonn, and Koblenz to the southeast. At some point early in their forced march James was made to serve on a detail to bury about 30 German war dead. They were kept in this holding camp for three days. They were then loaded onto a train with wooden cars, red crosses painted on the roofs, and doors tied shut with barbed wire. They were each given a piece of cheese and a piece of bread, and told that this would be all they get for two days and not to eat it all at once. There were at least 600 Allied POWs by then, packed 40 to a car. They departed on 28 December 1944, and traveled five days and four nights. 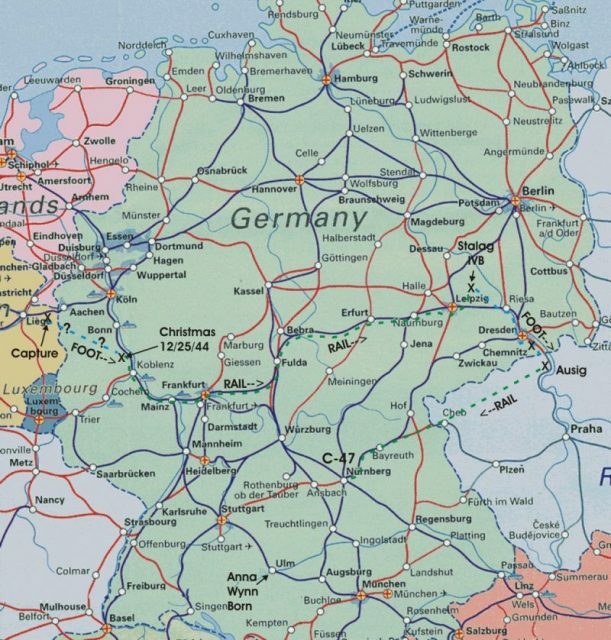 From a German railway system map, the most likely route started at Koblenz, south of Bonn, and passed through Ehrfurt and around Leipzig to Muhlberg. Each day the door was opened and a bucket of water was put in for the men to drink – but no food. The train traveled slowly, and often stopped. Each evening at dusk the train would pull into a rail yard and park overnight alongside ammunition or tank cars, disconnect the locomotive and leave until the next morning. The locomotive would then return and start moving again. The nighttime temperature was always in the low 20s (F) and they had to stand and stomp their feet all night long to keep themselves from freezing. The weather was clear and cold during this train trip. Around 2 pm on 2nd January they stopped to load the locomotive with water. There was a young German soldier manning a machine gun on top of the water tower, and a P-51 flew over. The soldier fired on it, and it flew on. All the POWs marveled at the stupidity of this act, and sure enough, about 20 minutes later the same or another P-51 came back and strafed the entire train. One American was killed and several wounded. Three rounds hit James’ railway car, and one guy took a bullet in his forearm. Since the wounded soldier was near James and his buddy, they started checking him to see how bad his arm was hurt. James had to slit his field jacket arm open to get to the wound. A .50 caliber bullet fell out into the straw on the floor of the railway car. After they had bandaged the man’s arm James gave the bullet to him and said here is your souvenir. 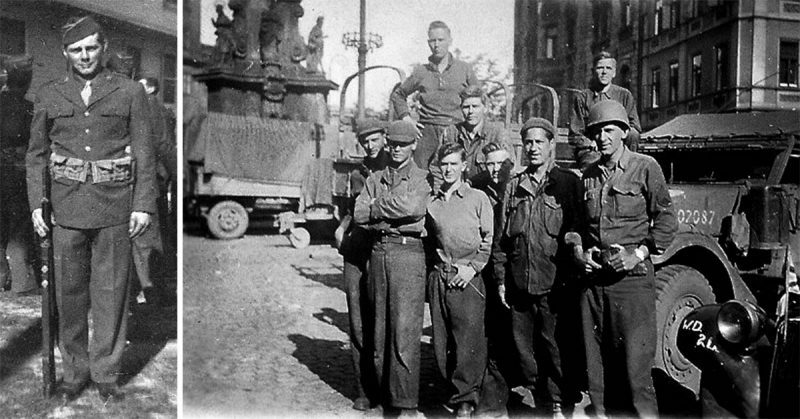 James saw the guy a week later at Stalag IVB and his arm was in a sling, but he appeared to be all right – and he thanked James for the souvenir which he had in his pocket. 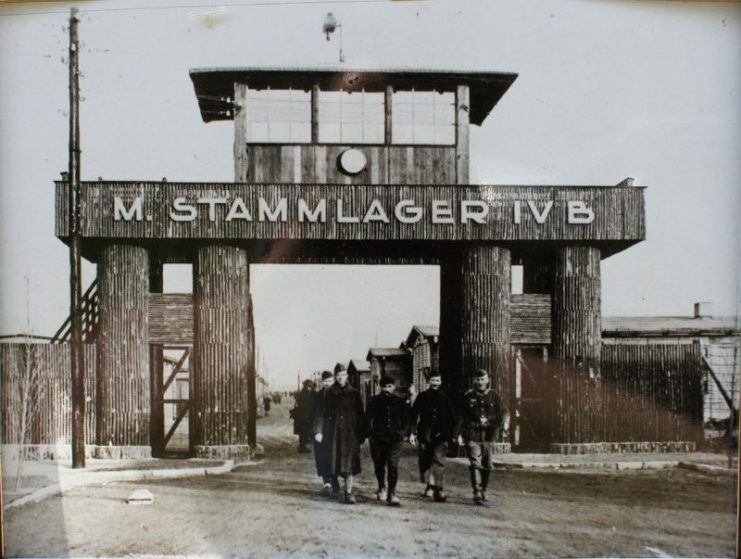 They ended up at a POW camp called Stalag IVB, located about 9miles (13 km) northeast of Muhlberg (see entry gate below left), and James said he nearly passed out as they staggered off the train. 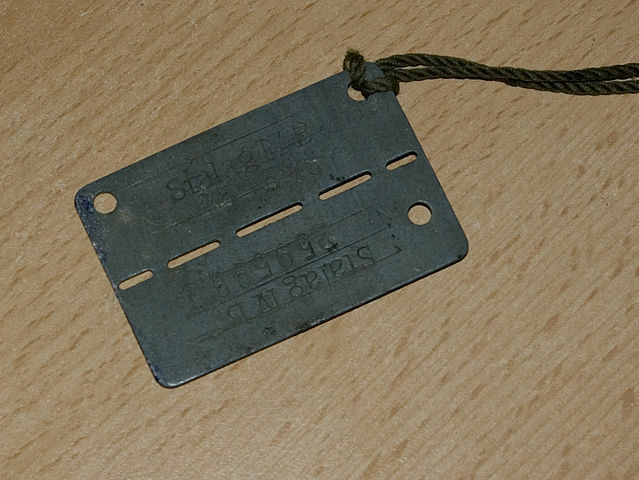 They were issued German prisoner-of-war dog-tags (which James still has; see example photo below right) and got their first food: Red Cross ration boxes that they had to share … one box per each five men. Find out about the slave labor for the Reich and the Dresden bombing in the next part of the story.. coming soon..
James Lincoln Wynn just celebrated his 95th birthday; He has two great-great-grandsons and he lives in Greenville, SC.